The St. Francis lady Terriers begin their four game road trip today as they take on the NEC leading Robert Morris Colonials at 4PM in Moon Township. St. Francis Brooklyn is coming of a 67-51 victory against Fairleigh Dickinson University on Tuesday evening. 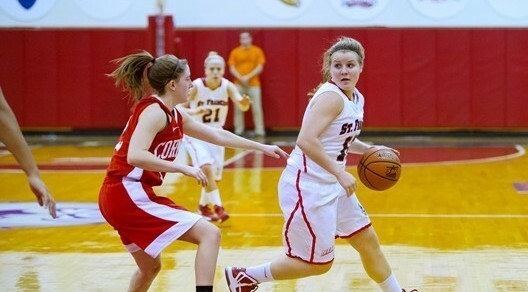 Junior forward Sarah Benedetti led all scorers with a season high 21 points. Sophomore guard Leah Fechko and junior forward Jaymee Veney both recorded a double-double. On Monday night, Robert Morris fell to Wagner College in Staten Island, 67-51. That contest broke the Colonials seven game winning streak, bringing them to a 12-9 overall record and an 8-2 record in the Northeast Conference. Leading scorers were freshman center Cassie Oursler and freshman guard Anna Niki Stamolamprou with 17 and 14 points respectively. This afternoon’s game marks the 53rd all-time meeting between the Terriers and Colonials, with the Colonials leading the series 36-16, but the Terriers will be looking for their third straight win against Robert Morris today. The last time these two teams played each other, St. Francis took the win in double overtime, 67-63. Benedetti, Fechko, junior forward Jessica Kaufman, and junior guard Eilidh Simpson all chipped in to come out on top. Although the lady Terriers had great momentum this past Tuesday, they need to amp it up a few notches and play great defense and offense in order to secure a victory. The St. Francis Terriers are hoping to improve their NEC record to 6-4 after today’s game, as well as their overall record to 16-6 and continue their two game winning streak.